The past few days have been filled with family and friends and it's been great. Christmas was very nice, I got my new camera! It's a Canon Powershot A590 IS. I love it, I'm still getting used to the settings but I know already that it's going to be so much better than my old Nikon Coolpix. I also got an iPod shuffle for the gym which I had totally forgotten I wanted so that was a nice surprise. The rest of the weekend was spent with friends. My friend Neli is moving back to Bulgaria so Friday night we took her out for a "not goodbye, but see you later" dinner at Chili's. Saturday I went to kickboxing, had a great workout, and then some of us decided to go to iHop for lunch. (I know how ridiculous that sounds...) I had read recently that they put pancake batter in their omelets (why?!?!) so I was ready to be very cautious about what I ordered. I asked the waitress if they could make an omelet without the batter and she was all confused and said that the omelet mixture is premade and she didn't think they could change that. It didn't occur to me at that moment to ask her to ask the cooks to make an omelet with fresh eggs, she was already too confused, so I orderd two eggs over easy and when I told her I didn't want the toast or pancakes she got even more confused so I said, just send them over, I'll give them to someone else. Someone later made a comment about iHop being the Burger King of breakfast restaurants and I laughed, so true. I didn't expect much from them so I wasn't too bothered by the situation. I'm still learning to be more assertive at restaurants. Last night, my cousin and I went to Uno's. I have been excited to try their GF pizza but as it turns out, my body needed protein so I ordered a steak instead. This was the most pleasant restaurant experience I've had so far. The waitress brought the gluten free menu right over and told me that she loves the pizza, she orders it all the time and that did I know they also have gluten free beer? (Redbridge) I was so happy and so comfortable knowing that I was having a safe meal and it was absolutely delicious. The steak was the right choice, it was excellent. I'll get pizza next time! I also had some time this weekend to think about what I want to do with myself now that I'm getting so much healthier. I have been wanting for so long to do more yoga so when I was shopping I picked up the 2009 yoga magazine guide to getting into yoga at home. I can't afford to pay for classes and would prefer to practice at home anyway. The magazine was great, I've taken yoga classes before but I've always felt like the instructors never really explain exactly how your body should be alligned and all that stuff. The mag really walks you through all the steps. I'll be starting with sun salutations for a while to build up but then there are 9 other sequences to work on. This should keep me busy for a while! 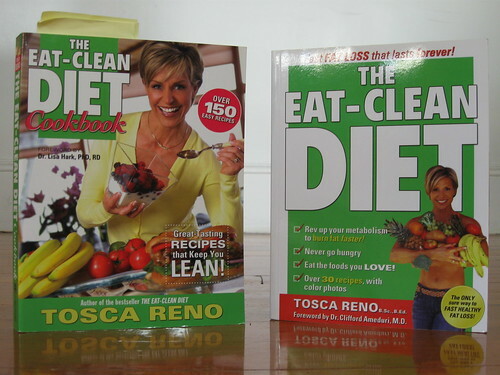 I also dusted off my Clean Eating books by Tosca Reno. The cookbook is full of great recipes and many of them are already gluten free, clearly marked so, and the rest can be converted. I really want to work hard to get into optimum health and well being this year! I will get back into the shape I was in a year and a half ago, healthy and strong, lose the 20 pounds I gained this year. I will do more volunteer work. I will step it up and take charge at work and pull us out of this rut, make sure that we stay strong through these difficult financial times. I will try to be less self centered and focus on others. I will take advantage of the opportunities that come my way. I will be more tolerant. I will tell people how I feel instead of keeping it inside. I will pay off my credit cards!!!! I will fix my car window and air conditioner and take better care of it in general. I will be an advocate for Crohn's disease and other auto-immune diseases. I could go on all day, but you get the idea. Just make 2009 better than all the years before. New Year's Resolutions may not always stick, but there's nothing wrong with taking advantage of the clean slate that January First brings. Those sound like a great prospective "to do list" for the new year. Let's call it that instead of resolutions. Taking it down a notch. Getting the word out for Crohn's Disease. I need your thoughts and advice. I hate to rush time, but is it January yet? Coffee Cake Muffins are my favorite.